Living in New Zealand in the early 1940s was a scary business for children and even more so for the adults who tried to keep the worry of the of threat of a Japanese invasion away from us. However for Frances, who lives in a lighthouse on an island where she is the only girl, has much more to worry about – including her young brother Stephen who is deaf and it seems she is the only person who can make him laugh. Writing a book far into a series that already has at least 26 titles is not easy but there is a freshness and interest about Lighthouse Family that I found particularly addictive and the attitudes and the prejudices of the time blend neatly into the story. Frances can be added to the writer’s growing list of appealing and likeable heroines. 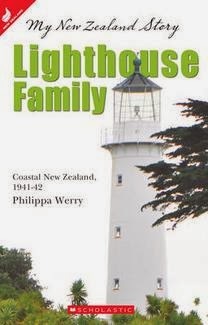 The extra fact pages, photos and timelines make it a useful resource for any study on Living in a Lighthouse.